Essential Woman from Barlean's Organic Oils contains vital nutrients that may provide relief to women before‚ during‚ and after menopause. Women undergo a variety of changes during menopause‚ which may have a significant impact on bodily functions and processes. This supplement from Barlean's Organic Oils contains a comprehensive formula‚ which may promote hormonal balance in women‚ especially during menopause. This may potentially help revitalize areas of cognitive function and alleviate excess heat in the body. 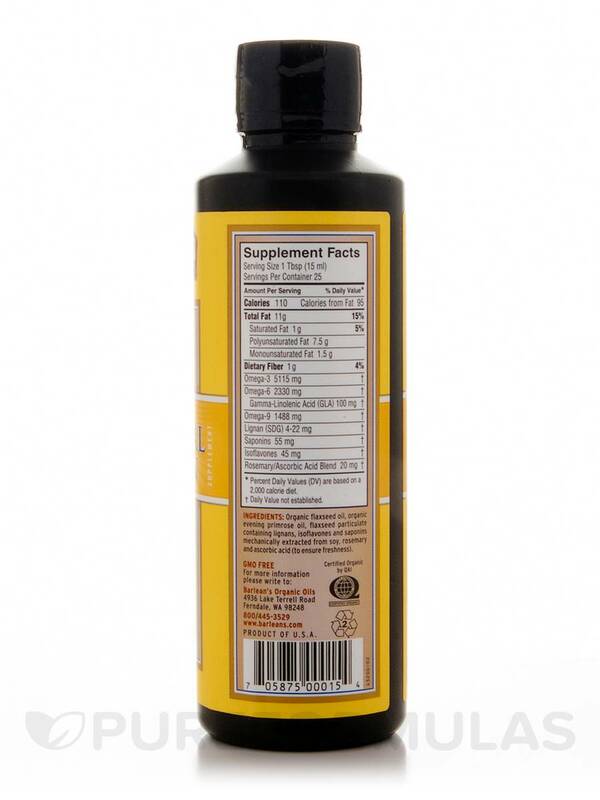 This supplement is made from seeds of botanical flowers such as evening primrose‚ flax‚ and plant phytonutrients. The unrefined flaxseed oil may provide vital omega-3 fatty acids that could promote cognitive ability‚ and more. The evening primrose oil contains gamma linolenic acid (GLA)‚ which may promote hormonal balance. This nutrient may also aid in the management of symptoms concerning PMS. This is an organic product. 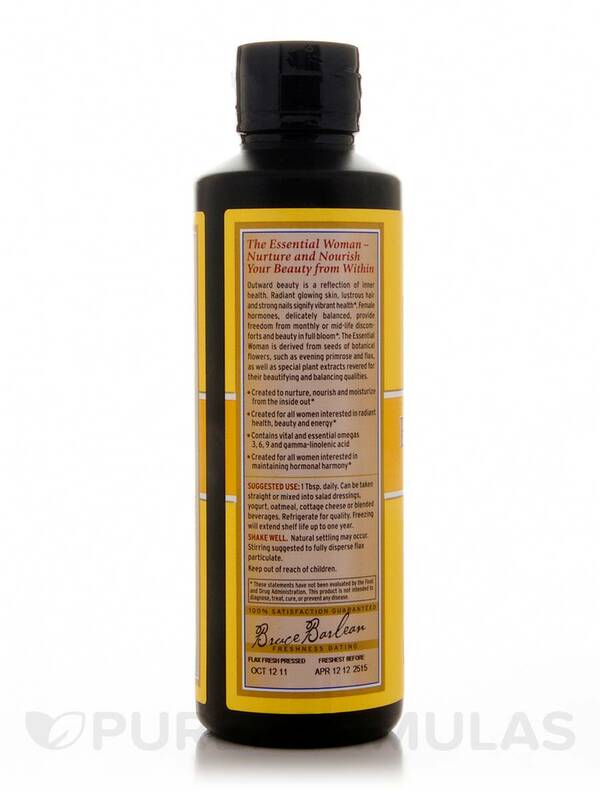 Try Essential Woman from Barlean's Organic Oils from PureFormulas today!. 1-2 Tbsp. daily‚ can be used in salad dressings‚ mixed with yogurt‚ cottage cheese‚ oatmeal‚ blended beverages & protein drinks. This product was referred to me by my acupuncturist as a relief for peri-menopausal symptoms. They helped me after a few weeks of once a day 1 T in my morning shakes. I have referred this product to several women. I have been using Essential Woman by Barleans Organic Oils since September 2012. I have a rare illness which also affects my skin. None of my doctors could help me not even my Dermatologist! My skin was red inflamed dry and itched. Now my skin is back to the natural color no itching and very soft. I am 59 and this is amazing to me and my doctors! My acupuncturist started me on it! I take it everyday and cant live without it! It has so many rich omegas and more to give your skin what it needs from the inside out! If it helped me with my serious illness think what it can do for you! It has healed my skin from the inside out! No problems at all with it. You do have to stir it very good since it settles thick on the bottom. I leave it laying on its side and stir and shake it so I get a full dose of it. You must keep it cold as soon as you get it.